A cheap self-assembly device capable of fabricating 3D objects has been developed by US researchers. They hope the machine could kick start a revolution in home fabrication – or "rapid prototyping" – just as early computer kits sparked an explosion in home computing. Rapid prototyping machines are already used by designers, engineers and scientists to create one-off mechanical parts and models. These create objects by depositing layer upon layer of liquid or powdered material. These machines typically cost from $20,000 to $1.5 million, says Hod Lipson from Cornell University, US, who launched the Fab @ Home project with PhD student Evan Malone in October 2006. 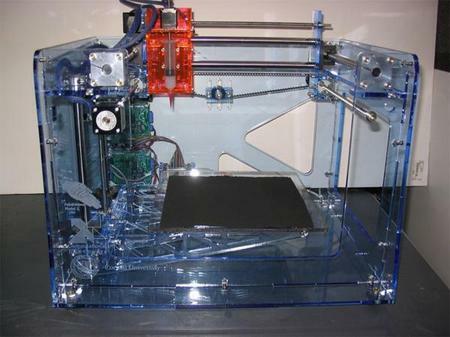 The standard version of their Freeform fabricator – or "fabber" – is about the size of a microwave oven and can be assembled for around $2400 (£1200). It can generate 3D objects from plastic and various other materials. Full documentation on how to build and operate the machine, along with all the software required, are available on the Fab @ Home website, and all designs, documents and software have been released for free. Very cool. Fab@Home is the main page for the project. They hope to spark something like the revolution that happened when the first home computer kit, the Altair 8800, was made available in 1975. It didn't really do much, but thousands of people started tinkering with it and finding useful things to do with it, and devices to add to it. So, if lots of hobbyists have a DIY fabricator at home, the same thing might happen. Certainly they would at least want to share the blueprints for stuff one could build with it. But most likely they'd also help make it better. Like, somebody has already figured out how to print chocholate bars with it. Sounds like a great invention - especially at that price. I have heard of other 3D-prototyping machines working with a system that goes works just about so: As raw material it has a transparent substance which can be dissolved by water until it has been exposed to laser light at a certain intensity - which is reached where two different laser beams cross each other. Thus one can process the material 3-dimensionally. After exposure, all the material that was not exposed is flushed away with water. This is pretty much the same way you make a screen for screen printing - only here it is 3D. The drawback is that this system is very expensive, uses expensive raw material and causes other logistic problems. And does not fit on a desk top. I might feel tempted to buy one of these new, less expensive devices, but one thing bothers me: Is there any information available about the possible health hazards caused by the fumes from the materials used? 3D printing can be great for excellent design process for home printing, teach children and for fun.I have bought EVOLUTION Gen2 Fully Assembled 3D Printer. They came out great! I love the first phthrgoapo, she finally gave you some smiles. The blue really looks nice against the red barn, I can’t wait to see the rest of the photographs we had a great time taking the photos with you!